After a string of foreign interventions - Afghanistan, Iraq, Libya, Yemen, and finally the West’s war in Syria - that failed to reach their strategic objectives, the 21st century seems to have finally witnessed its first successful foreign intervention – the Russian intervention in Syria. While the intervention might do no good to the cause of human rights and resolving the quagmire quickly, it does seem that Russia has achieved most of its strategic objectives. The swift war, coupled with American dithering on Syria, has allegedly1 won 10,000 sq.km. of territory for Assad, putting Putin firmly in the driver’s seat in every negotiation for Syria’s future. More importantly, it has set the stage for Russia’s return as a force to reckon with in the Middle East. Also, despite disproportionately2 killing civilians and assisting a dictator responsible for deaths3 of over 150,000 of his own people, Putin has cleverly managed to put a halo of righteousness around his Syrian adventure, something that was missing in Russia’s war with Ukraine and Georgia. Russia always had strong interests in keeping Assad intact. After Soviet Union’s breakup, Tartus remains one of the few Russian military outposts anywhere in the world. Syria has also been a major buyer of Russian weapons. Russia - after preventing overt armed intervention by the West by vetoing several UNSC resolutions - has ensured that its military induces a shift in discussion on Syria from Assad’s ouster to one which involves him as a significant player in the ravaged nation’s future. The West has complained, rightly4 so, that Russian bombs haven’t weakened ISIS enough. A deeper reading of the intervention shows that ISIS was never the major target. The foremost objective was to prop up Assad, which meant the bigger targets were the Western-backed, so-called moderate rebels, who have so far posed a much greater existential threat to Assad than ISIS has. As per this objective, Russian planes enabled the Syrian army to recapture most of the strategically critical Aleppo Governorate, and partially cut off rebels’ supplies from the Turkish border, on which they’ve been heavily dependent. In fact, the pounding of moderate rebels helped ISIS5 capture territory from them in parts of Aleppo. But recent developments show ISIS is the next target. To Putin’s credit, Machiavellian diplomacy has backed his military, especially in weakening ISIS. Once most of the work against moderate rebels in Aleppo was done, Putin engineered a ceasefire in Munich which excluded certain groups, including ISIS, from its ambit (there are reports6 that those under its ambit have also been targeted in the guise of attacking ISIS). This enabled Syrian forces, ably backed by Russian airstrikes coupled with Hezbollah and Iranian forces, to focus on pounding ISIS. As a result, in Aleppo, when the group got close to Kweires airbase, which is strategically crucial to Assad, heavy Russian bombardment7 ensured they were driven north of Aleppo, a region not of immediate concern to Assad. Similarly, riding on Russian airstrikes, Syrian army ousted ISIS from the strategic city of Khanasser in Aleppo Governorate’s southeast, thus clearing a major supply route to Aleppo city. Another major blow to ISIS has been recapture of Palmyra by Assad. The city, often glorified as an “oasis in the desert”, is strategically important because it’s situated on the middle of a long road from Damascus to Iraqi border. In ISIS’ hands, the road was a significant security threat to Assad, because it allowed the group to strike Homs or Damascus, which is why Russia helped Syrian army take it back. Given Russia’s successful involvement thus far, Putin’s announcement of withdrawal from Syria came as a shock to most observers. However, as subsequent analyses8 have shown, Putin’s forces remain well and truly committed to Syria, and in his own words, could be beefed up “at hours’ notice”. Besides its intention to yet again fox the West, the announcement also carried a message for Assad – that his victories were solely due to Russian intervention, and not toeing the Russian line would incur Putin’s wrath. The endgame of Russian airstrikes is to bolster Assad, but only to the extent that allows Russia to lead the political settlement of Syria. Assad, wanting to wrest back control of his country, has been severely opposed to any political settlement. Assad was even asked to step down9 back in 2012. More recently, in a rebuke to Assad’s professed objective of wanting to regain control over all of Syria, Russian UN envoy Vitaly Churkin said Assad’s remarks “do not chime with the diplomatic efforts that Russia is undertaking.” Thus, the announcement of withdrawal might well have been to scare Assad into submission. It seems that has worked10, as recent statements by Assad countenance a role for the opposition, which he hitherto deemed terrorists. Already, Russia is driving political resolution of the crisis. This is evidenced by Kerry’s visit to Moscow, Russia’s co-chairing of ISSG11 – a group of 20 countries and organization - talks, and by its negotiation of the ceasefire in Munich. After several vetoes, Russia voted for UNSC Resolution 2254, which calls for peace talks between the government and the opposition, and formation of a new constitution followed by elections within 18 months. Curiously, Russians have mooted the idea of a federal Syria with considerable autonomy to provinces. That might mean Putin wants Assad, or someone else favourable to Russia, to be in-charge of the territory from Latakia province to Damascus, which holds Russian naval base of Tartus and airbase of Khmeimim. The Syrian crisis has enabled Russia to become a key power in the Middle East. 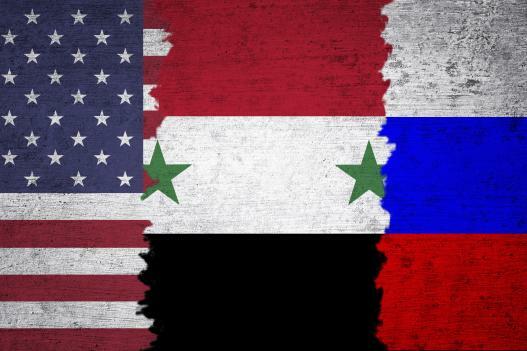 Capitalizing on the American void in Syria, as well as the broader cooling off of relations between US and its hitherto Middle Eastern allies, Putin has used his lead in Syria to warm up to these countries. There have been several high-profile visits by Saudi and Israeli leaders to Moscow, involving discussions ranging from oil prices to weapon supplies by Iran to Hezbollah. Moscow has also used this conflict to improve relations with Tehran. The good relations between them were evidenced by Tehran’s sending all its low-enriched Uranium to Russia as per the nuclear deal. In Syria, the two are fighting shoulder to shoulder for Assad, though Iran wants Assad back in total control without a political process, a condition clearly unacceptable to Russia. There is no doubt that Putin’s smart use of military power and diplomacy has created geopolitical challenges for US, and the next American president would have to make considerable investments in the region. Despite the rivalry between Washington and Moscow, the two have cooperated on the Syrian issue – from destroying Syria’s chemical weapons to bringing the warring factions to the negotiating table, most recently in Geneva. However, the bitter distrust between these factions, as well as diverging interests of the international powers involved, have ensured that talks have always failed. There are two key disagreements: who constitutes a genuine Syrian opposition, and the role of Assad. Turkey has high stakes in the conflict since it does not want Kurds - millions of whom it has rendered stateless - to establish an autonomous province on its border. Russia, despite Kurds being its important allies in the conflict, has refrained from insisting on their inclusion in the talks, but it has strongly objected12 to inclusion of two groups in the Syrian opposition, called High Negotiation Committee. Turkey will not agree to let Assad play any role in Syria’s future. Israel too is keen to see Assad’s back since he’s been the main link between Iran and Hezbollah. European powers, especially France, wish to see Assad ousted. Under Obama, US might be more tolerant towards Assad, but that policy might turn on its head under the coming President. On the other hand, Iran can’t countenance Assad’s exit. Russia can, but only after it has ensured all gains that can come from him. On top of all this, ISIS and Al-Nusra, two of the fiercest terrorist groups in Syria, are not part of the negotiations. While including them might not be an option, it does leave room for prolonged conflict. Given the circumstances, it seems Syrian people are in for more misery.